I was only a child when I first watched the film Seven Brides for Seven Brothers. It brought the screen alive with colour and breathtaking choreography, the like of which had not been seen before - backswoodmen dancing over axes and somersaulting over logs in turn of the century Oregon. It's a song and dance spectacular from the golden age of MGM musicals, made in the same decade as Brigadoon, Gigi and Singin' In The Rain. That's probably why it has that same feel-good factor that can cheer you up even after the longest, hardest, most miserable of work days. It's an updated version of Seven Brides for Seven Brothers that is currently touring the UK and stopping off at various theatres in the Midlands including Birmingham's New Alexandra Theatre, New Theatre Oxford and Regent Theatre in Stoke-on-Trent. There's also Liverpool Empire, Theatre Royal Brighton, New Victoria Theatre Woking and Richmond Theatre in Richmond on the tour map. This production is slightly different from the film, but that's a good thing as it adds a freshness to the proceedings and also means you don't constantly compare it to the Hollywood classic, which would leave it on a hiding to nothing. For a start, some songs are lost, but there are new ones in their place that have more of a West End flavour. Personally, I think it's a shame June Bride and Spring Spring Spring have been cut, but there's plenty of the favourites like Wonderful Wonderful Day and Bless Your Beautiful Hide to keep the show lively and fun. This modernised version is also much more raunchy than the original. The handsome brothers waste no time getting their clothes off to display rippling muscles and six packs (and more! ), while the suggestive dance routine that accompanies We Gotta Make It Through The Winter has the frustrated brothers writhing about in moves that would have made The Chippendales proud. It adds a touch of extra humour. The story follows Milly as she meets and marries woodsman Adam in the same day in a small town in Oregon. It's only when she reaches his home in the wilds that Milly finds out he has six unruly brothers and she is expected to cook and clean for them all. Cleaning up the brothers and teaching them some manners, Milly encourages them to mingle with the townsfolk and meet some girls, but brutish 'caveman' Adam ends up causing chaos with their courting plans when he encourages his siblings to kidnap the women and make them their brides. Taking on the lead role of stubborn woodsman Adam - made famous by Howard Keel in the film version - is Sam Attwater, formerly Ricky in TV soap Hollyoaks and a champion of reality show Dancing On Ice. Unfortunately, he was taken ill during the press night in Birmingham and replaced by understudy Alex Hammond. Despite this, it was hard to tell that Hammond wasn't the lead actor as he gave a confident, charming performance. Adam's better half Milly is played by Helena Blackman, a runner-up in BBC1's singing reality show How Do You Solve A Problem Like Maria? 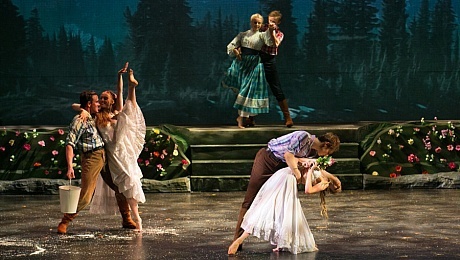 Blackman's powerful yet sweet voice stands out from the rest of the cast and she manages to quickly win over the crowd's affection as romantic Milly, who is unsure whether her new husband Adam really loves her or married her just to look after him and his six brothers. Each of the brothers has a special trait, which makes them individually likeable. The youngest Gideon is adorable and looks eerily like Zac Efron. But the highlight of the show is the barn dance scene, which has kept much of the film's famed choreography by Michael Kidd from the 1950s, but also added the zest of more acrobatics. It is awash with swirling bright coloured skirts and cheekiness as the brothers dance the women off their feet, literally. The secret to a good musical is that it stands the test of time and can whisk you into a bubble of song and dance joy for at least a few hours. 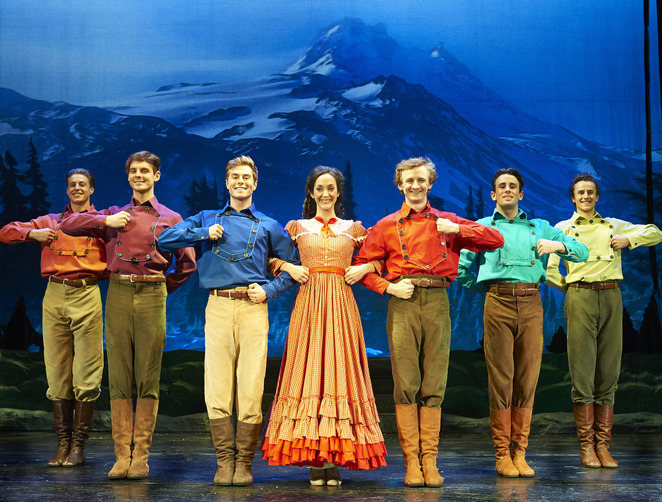 Seven Brides for Seven Brothers is one of those classic musicals and this updated version, co-produced by Paul Nicholas, still has the wow factor that will make you go yee-haaa. New Alexandra Theatre, Birmingham - Feb 3 - 8. Tickets cost £17.90 - £48.90 . For a full list of tour dates and to buy tickets, visit the ATG Theatre Tickets website or by calling 0844 871 3011.